Crowds gathered outside the Elysium nightclub located in the storied Austin Texas Red River Music District on March 19. The excited faces were lit up by the funky neon lights and buzzing from the sounds coming all the way from Taiwan. Taiwan Beats marked the second official showcase of Taiwanese music to the SXSW Music Festival which has grown to become a truly international influence in recent years. 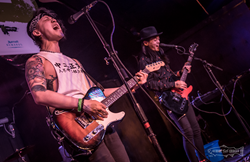 Taiwanese music and talents have had a strong presence in SXSW for several years, however, the critical acclaim came last year when GCA Entertainment put up an official Taiwan night that excited the cosmopolitan Austin music community. Celebrating the 30th anniversary of SXSW, Taiwanese Ministry of Culture (MOC) and Bureau of Audio-visual and Music Industry Development (BAMID) teamed up with GCA Entertainment again to bring a night with Mandarin Rock, Eclectic Hip Hop, and even Mando-flavored Britpop. The three showcase artists who were recommended and honoured with highest prestige music award in Mandarin music industry, Golden Melody Awards (GMA), are Aristophanes, Trash and QueenSuitcase. Together with three guest appearances from The Flavr Blue, Dwagie and DJ Ray Ray, the six groups gave the audience a night that represented the best of indie music. The night is unveiled with waves of DJ Ray Ray’s unique beats, followed by special guests, the Seattle-based band The Flavr Blue, with their contemporary sound. For the second year in the row, legendary Taiwanese rapper Dwagie brought us his unique and socially conscious Taiwanese hip hop. The award-winning Taiwanese rock band TRASH stormed onto the stage with their power punk set. They were followed by QueenSuitcase as lead vocal Carla’s buttery voice echoed in the room. As the grand finale, DJ, rapper, experimental performer Aristophanes started her murmur with her sultry voice. It’s easy to see why Canadian artist Grimes choose to collaborate with her. Last year, Taiwan showcase stormed the stage of Icenhaur’s, this year, Elysium and Cheer Up Charlie’s both witnessed the explosive power and talents from Taiwan. Just as the saying “third time the charm”, what will the Taiwan showcase brings to SXSW next year? We can only wait. Founded in Taipei, capital city of Taiwan, nestled between the high mountains of Taiwan and the traffic-busy Taiwan strait. The agency positioned itself as the bridge between East and West, constantly pushing the limits of music industry in Greater China region and linking business and talents in all corners of the world.